Jack Black is one of Hollywood’s most gifted funny men. He has the unique ability to tackle all levels of cinematic comedy. He can do R-rated fare, animated voice-over, family-friendly films, and just standard, middle-of-the-road stuff. However, his talents do not limit him to film. His band Tenacious D has been touring for over two decades. Also, his hilarious appearances on television are fantastic. His cameo in The Last Man on Earth was one of the funniest moments ever on that show. Black is known for his manic, unbridled energy. Often times, that approach has gifted us some classic comedy. 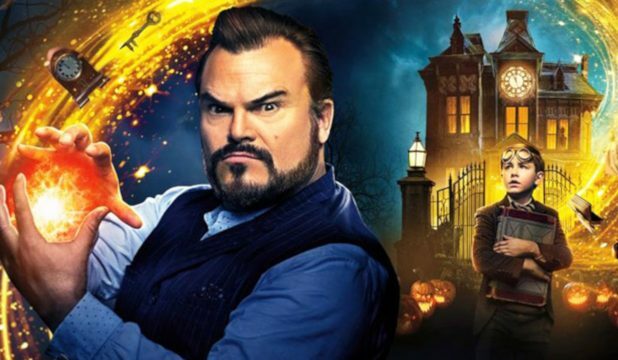 Recently, Jack Black headlined a decent hit, House With a Clock in its Walls. It is a perfect example, along with last year’s Goosebumps, where he can perfectly reign himself in and entertain the kiddies. However, as you will see, he has the ability to dial up the raunch and profanity to entertain the adults. 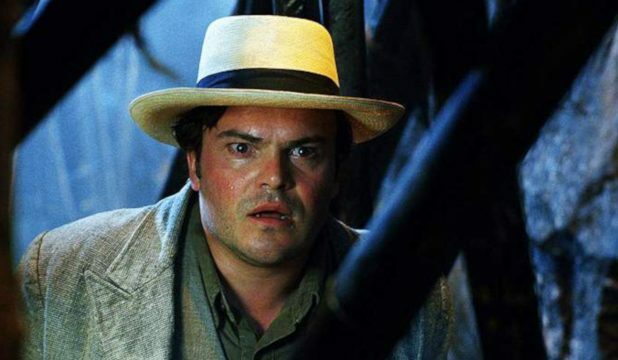 Here are the top 10 Jack Black performances. The 2005 King Kong is a complete overindulgence by director Peter Jackson. After his monumental success with the Lord of the Rings trilogy, he had carte blanche do do anything he wanted. So, he made a bloated remake of his favorite film. Still, it is pretty decent, and the casting of Jack Black as Carl Denham was pretty brave. However, it works. He brings a sort of naïveté that the doughy filmmaker needs. He needs the shots, and he is ignorant of the danger that need might put him in. With the massive special effects action sequences overtaking most of the film, Black is a welcome character to bring the film a bit back down to Earth. This HBO series only lasted one season. It is a huge shame because both Tim Robbins and Jack Black are hysterical. Robbins is the Secretary of State and Black is a Foreign Service Officer. Through Dr. Strangelove-ian hijinks, the world comes to the brink of World War III. The premise is inherently ill-equipped to last multiple seasons, but the one we get is very fun. Black’s role becomes the man thrown into the middle of the higher-ups of the government. He was in the wrong place and the wrong time, and now he is a ridiculous fish-out-of-water. It is a lot of fun to watch him play off the overly-confident and proficient Robbins. Purchase now on Amazon for $29.98. Few people have seen this Netflix film. Which is a huge shame because Jack Black nails it. It tells the story of Pennsylvania Polka legend, Jan Lewan, whose vast Get Rich Quick schemes eventually landed him in jail. However, it is so much more than that. In a reality is stranger than fiction situation, to see how Jan believes he is allowed this type of deceit in America is hilarious. The lengths he goes to make millions of dollars it outrageous, but impressive in its audacity. Black, in full blonde wig and Polish accent, plays Jan with innocence, darkness, and total respect. He is a sort of Polish, Polka-rocking, Jordan Belfort. 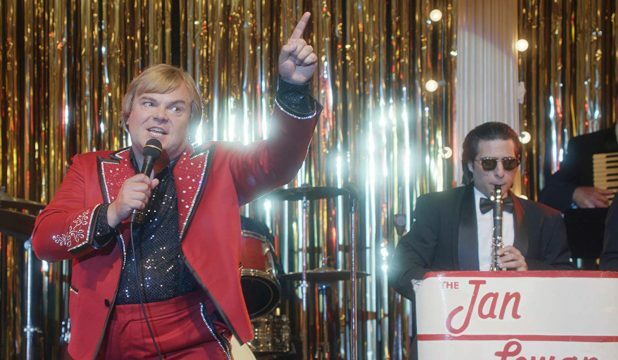 Lewan was a larger than life celebrity, so what better man to play him than Jack Black? Purchase now on Amazon for $15.26. 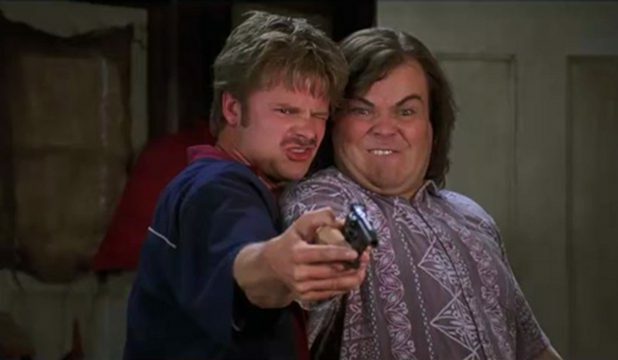 There is no depth to Jack Black’s performance in Saving Silverman. He is juvenile, silly, and at his most Jack Black-ian. However, he is hysterical. Pulling dual-duty with the always entertaining Steve Zahn, the pair kidnaps their best friend’s fiancee because she is destroying their friendship. It is a pretty stupid premise, but you can’t help but laugh at Black and Zahn’s antics. They are part of a Neil Diamond tribute band, so that provides a lot of laughs. Then there is the oppressed homosexuality, the indulgent eating, and the bursts of vocal emotion that underline the cartoon character Jack Black is. Purchase now on Amazon for $8.49. Jack Black’s vocal performance as Po sits among the best in animation history. It is that good. 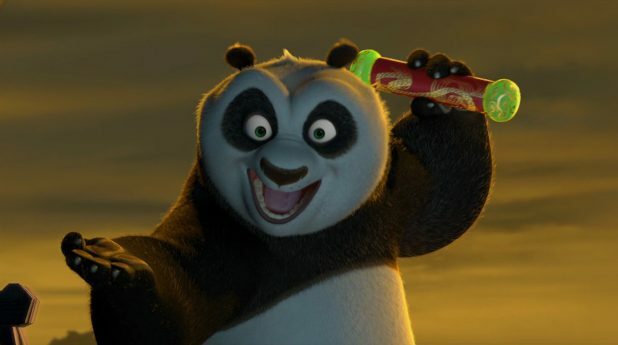 Po is a panda who learns that he may just be the mythic Dragon Warrior. Regardless of his girth and lack of agility, he agrees to be trained by Shifu and the Furious Five. To play the bumbling student who only seems to advance his training through food, Black is perfect. Po is one of those on-the-nose casting choices where you couldn’t possibly imagine anyone else voicing the role. It is honestly akin to Robin Williams as the Genie. It is the way Black brings excitement, disappointment, fear, and hilarity to the role of Po that makes Kung Fu Panda one of the very best films from Dreamworks Animation. Any comedian worth their salt has had a chance to work with the Farrelly brothers. Jack Black had his chance with Shallow Hal. It is a film about a superficial man who is whammied by Tony Robbins so he sees peoples’ inner beauty expressed as outer beauty. It is this spell that causes Hal to fall in love with Rosemarie, who looks like Gwenyth Paltrow on her best day to Hal but in reality, she is obese. The message in this film walks a weird line between body positivity and fat-shaming, but Black brings a lot of heart and poignancy to the role alongside his usual kinetics. Any argument against Black’s acting ability will disappear during the scene where a spell-less Hal sees Cadence, the child burn victim. That moment will truly melt your heart. 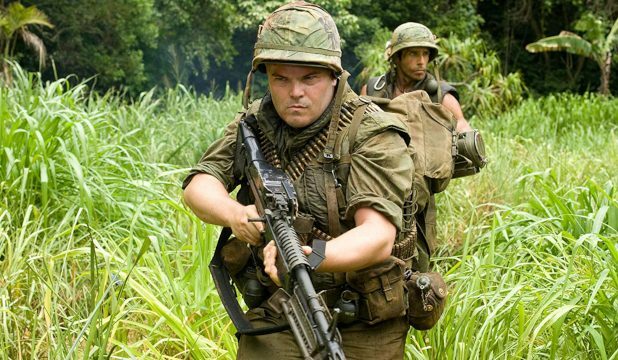 Jack Black dials it up to 11 in Ben Stiller’s masterful comedy, Tropic Thunder. He plays Jeff Portnoy, essentially a version of Jack Black in the Tropic Thunder world. He is the comedian in the big-budget war movie, out to garner a bit of Hollywood respect. The problem is that he is on location and he is running out of heroin. Black plays Portnoy’s jonesing with an absurdly, out-of-control insanity, but Stiller is talented enough to keep it focused and funny. Most of the R-rating for the film is courtesy of Black, and it is never not funny. When he scoops up the young soldier and runs through the camp in his underwear screaming don’t judge me, Black proves he is brilliant. 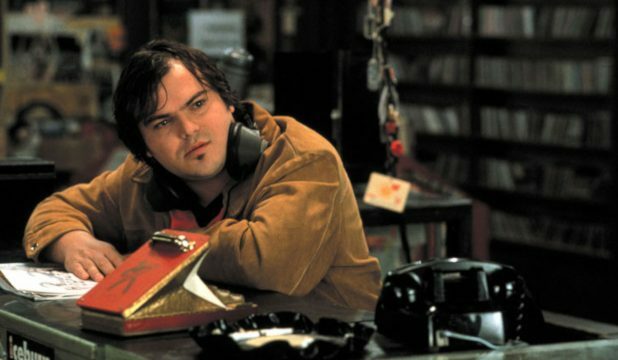 It was the role of Barry Judd in 2000’s High Fidelity that really introduced everyone to the character that is Jack Black. Taking a page from Jeff Anderson’s Randall in Clerks, he shows nothing but contempt for the musical taste of his customers. Not only that, but he is more than a match of musical knowledge for John Cusack. More so than most of Jack Black’s performances, this role comes across as effortless. He has the manic energy he usually does, but it somehow comes across as natural and purposeful. He is almost the sole reason to watch this film, and High Fidelity is a great Nick Hornby/Stephen Frears movie. Jumanji: Welcome to the Jungle took the world by storm in 2017. Few people thought it was a good idea to sequelize a 20-year-old, beloved Robin Williams movie. Little did they know it would be one of the funniest, most successful films of the year. Jack Black plays Bethany in the body of Professor Shelly Oberon, and he is the funniest part of a very funny movie. Where Dwayne Johnson and Kevin Hart play essentially themselves, Black commits completely to be a 16-year-old girl. His exasperation at not having his phone, hard crushing on Bravestone, and amazement at his “man parts” are some of the funniest things Black has ever done. His delivery of I can’t even with this place is pitch perfect. There could only be one performance at the top of this list. Jack Black’s role of Dewey Finn is his most iconic, most well-suited, and filled with the most passion. 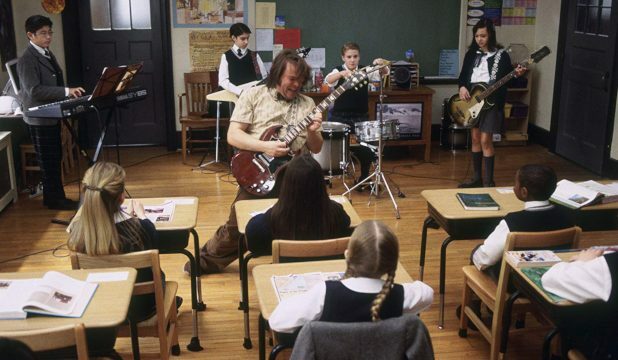 School of Rock is the gold standard to use as an exhibition of the tour-de-force Jack Black can be. Richard Linklater so perfectly knew how to utilize the Jack Black persona and injected into a story about prep school kids and their blossoming love for music. The movie is so good, that it was adapted to be a Broadway musical. However, without Black at the forefront, it just wasn’t the same. Throughout a respectable, successful comedic career, the role of Dewey Finn is surely going to be the great Jack Black’s legacy. 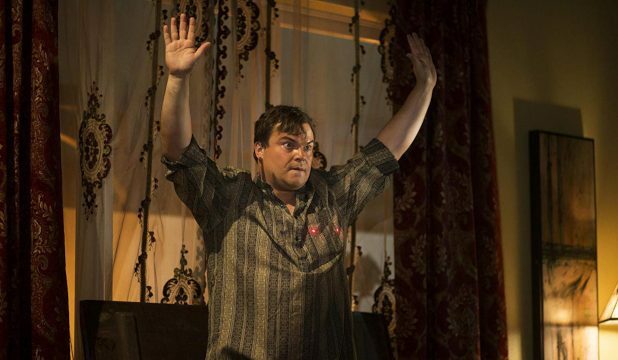 The post The Top 10 Jack Black Movies appeared first on ComingSoon.net.